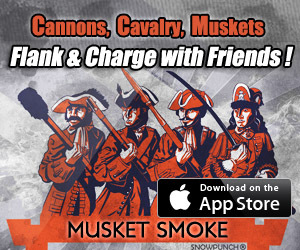 Musket Smoke Campaign on Sale! The campaign is on sale for a week. (3rd week of Oct 2015). If you know anyone on the fence about getting the campaign now’s the time to pull the trigger. Also do not forget that we now have EXTRA BASES in Mini Matches. A base is a hex location worth 4 points. Mini Matches are worth 10 points. In Mini Matches units killed are worth 1 point each. This change is yet another gentle push towards position and strategy over brute force. So far I have been really enjoying the new battle dynamics. Musket Smoke 1.61 update submitted. Again apologies, but the update will be here shortly. In the meantime there is always the AI. You could give yourself a small army vs a larger AI army and see how you fair. Or pass n play with a friend on the same device. At least there is a reward at the end of the wait. The new extra bases in the Mini Maps should prove to be interesting. I can hardly wait to jump into the fray myself. There is an issue with the 1.60 update. The snowpunch testing department had an off day. It was an iOS 9 compatibility issue. An emergency fix was done and submitted to Apple. Apologies and thanks for your patience. Extra bases for Mini Maps in new update 1.60. 7 Mini Maps have been modified and now have extra bases. This 1.60 update was just supposed to be a quick bug fix. A brief maintenance update. But then I noticed some low hanging fruit. Adding/removing bases is quick and simple, so why not shake things up a bit? Keep in mind that this is just an experiment. Try to play each map at least a few times before you give me your feedback on if you like the changes or not. The NEXT update (1.61-not scheduled yet) will finalize, modify or remove these changes. So remove the extra bases (same as before) or make the number random. So for example – a map might have 0-2 bases per side (mirrored). Hopefully these changes bring new types of battle situations and require the exploring of alternate tactics.